FRIDAY, Jan. 19, 2018 (HealthDay News) — A pill-sized device that you swallow might help detect a change in the esophagus that can lead to a deadly form of cancer, researchers are reporting. The esophagus is the tube that carries food from your mouth to your stomach. And the change that occurs in the esophagus, known as Barrett’s esophagus, usually results from long-term reflux. Barrett’s esophagus is considered a precursor to a type of cancer called esophageal adenocarcinoma. More than 80 percent of people diagnosed with this cancer die within five years. Yet, medical experts say that many of these deaths could be prevented if people were diagnosed earlier with Barrett’s esophagus. However, that usually requires a costly and invasive test, known as an endoscopy, that also requires sedation. According to the researchers, this prevents some people from being screened for the condition. Screening with the new device could one day change that, the authors of the new study suggest. “Our goal is early detection,” Dr. Amitabh Chak, a professor of medicine and researcher at Case Western Reserve Medical School in Cleveland, said in a university news release. 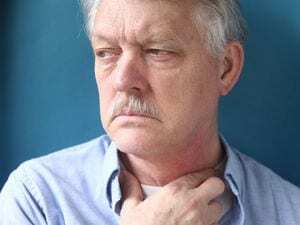 “Symptoms of Barrett’s esophagus, such as heartburn, can also be commonly seen in individuals who have acid reflux disease without Barrett’s esophagus. These symptoms can easily be treated by over-the-counter medications so people often don’t get tested for Barrett’s esophagus, particularly by an invasive test such as endoscopy,” Chak explained. This has meant that, about 95 percent of the time, people haven’t known they had Barrett’s esophagus until diagnosed with cancer, he said. To address this issue, the researchers developed the swallowable device. Using it to test for Barrett’s esophagus takes five minutes and is more than 90 percent effective in detecting the condition, they said. The device is about the size of a vitamin pill. It’s attached to a thin silicone catheter. Once swallowed, it enters the stomach. Doctors then inject air into the catheter to inflate a small balloon. The balloon is moved around to swab the lower esophagus near the stomach — the area where Barrett’s esophagus usually develops. The swab collects a sample of cells before it’s deflated, pushed back into the catheter and retrieved through the mouth. The cells extracted by the device are then analyzed for abnormalities. A clinical trial involving 86 people showed the swallowable test was more than 90 percent accurate in detecting those with Barrett’s esophagus. Also, 82 percent of those who had the test reported little or no anxiety, pain or choking during the procedure. About 93 percent said they would do it again. “We wanted an easier, less costly test that could provide a practical way for screening and early detection of individuals with Barrett’s esophagus, who can then be followed closely to prevent development of [esophageal cancer],” Chak said. A report on the device and the clinical trial results was published Jan. 17 in Science Translational Medicine. The U.S. National Institute of Diabetes and Digestive and Kidney Diseases has more about Barrett’s esophagus.